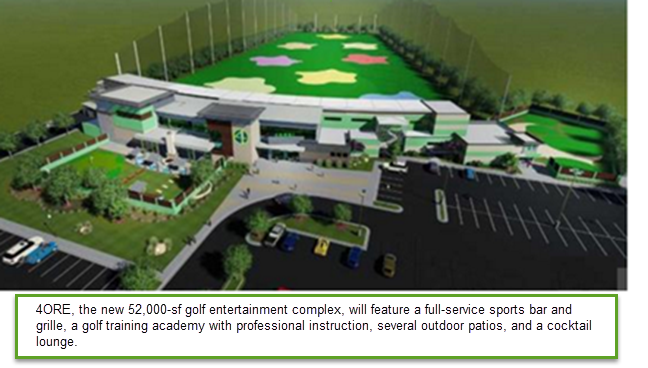 ​The facility will offer ​60 tee boxes, a 286-yard range, three bars, a restaurant that seats 200 guests, an eclectic food-and-beverage menu and 2,500 sf of meeting space for business groups. There will be live music on weekends and an adults-only lounge, called the Loft. 4ORE! is managed by the Arizona-based course-management firm, Troon Golf. The facility faces east, blocking the westerly winds, and there are natural-gas heaters and misting fans to accommodate year-round play. ​​Check out ​Lubbock Chamber of Commerce​ for more.